Proceeds from the sales of Girl Guide Cookies support Guiding activities. As our primary fundraiser, this make it possible to offer an exciting environment where girls and women can grow--through varied activities and programs, fun friendships, adventures, learning and leadership. Girl Guides are excited to offer a great Canadian cookie tradition again. Chocolate and vanilla sandwich cookies are available from April 1 to June 30. Chocolatey mint cookies are available from October 1 to December 31. Girl Guides across the province will be in neighborhoods selling cookies that taste better than ever. 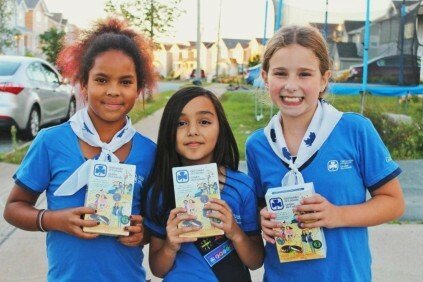 Look for Girl Guides selling door-to-door or around local communities.If a member of Guiding does not come to your door selling cookies and you would like to support our Organization, cookies can also be purchased at the Provincial Office at 3581 Dutch Village Rd, Halifax (902) 423-3735.